An exciting construction set with 100 pieces including 3 vortex, 3 paddle wheels, a wiggly bell chute, staircase, two way chute, 180 degree turn and much more. Create small, simple marble runs or more complex structures with the colourful slot-together plastic pieces. The marbles will disappear inside the columns, roll down the variety of chutes, spin through the paddle wheels and ring the bell on the wiggly chute. The illustrated booklet indicates exactly which pieces are required to recreate each design. 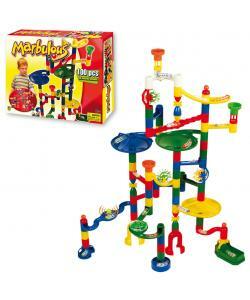 Starting with a quite simple 15 piece marble run, they increase in size and complexity. 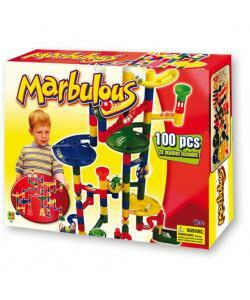 The Marbulous 100 piece set will provide many hours of fun for younger and older children alike.